The David Milch/Kem Nunn HBO series John From Cincinnati (which ran for 10 episodes last summer and was canceled) exists inevitably in the shadow of the nonsense that killed Milch's brilliant Deadwood before its time. "For this," the average viewer will say, "we lost Al Swearengen?" That's too bad, because JFC, flawed, meandering and often downright irritating, is still full of some master strokes of comic eccentricity. 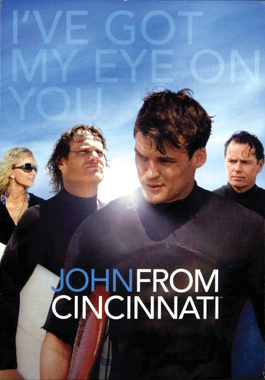 The show follows nine days in the lives of a legendary Southern California surf family: father Mitch (Bruce Greenwood), who blew out his knee and has started levitating; son Butchie (Brian Van Holt), a brilliant wave stylist brought low by drugs; and grandson Shaun (Greyson Fletcher), whose bright future is coveted by a slimy surf-gear entrepreneur (Luke Perry). Butchie couldn't handle being a father, so Shaun is the responsibility of grandmother Yost, played with "ball-busting" intensity by Rebecca De Mornay. When a gangling naif named John shows up, babbling nonspecific religious parables and performing miraculous acts of healing, all sorts of bizarre complications ensue. Milch and Nunn create a fine rogue's gallery of characters: Von Holt's Butchie is very amusing as a perplexed, set-upon stoner; Luis Guzmán, Matt Winston and Willie Garson constitute a bewildered Greek chorus at the rundown motel where Butchie lives and much of the action takes place; Dayton Callie (Charlie Utter on Deadwood) grumbles menacingly as a tattooed drug dealer who spars with the Yost's family friend Bill (Ed O'Neill of Married With Children), an ex-cop who follows the oracular advice from his pet parrots. At its best, the show engages in the elliptical, baroque dialogue that distinguished Deadwood: "Retired cops don't get my name, what time it is or pissed on if they go up in flames." "That would be a mistake by you, pertaining to me." "Then go up in flames, and I'll piss on ya." The looney antics of the Yosts and their various hangers-on would be enough, but the show's central conceit grows irksome. John (Austin Nichols) makes Forrest Gump look and sound like Gore Vidal. Eventually, John's constant allusions to the "words of my father" and admonition to "see God" drown out the humor in a swamp of quasi-Christian msyticism. Milch himself obviously takes whatever point he was trying to make very seriously, as can be seen in the featurette about the making of the central dream sequence, in which he tells the actors, "The reconstruction of experience does not have to be fetishized." Remembering Tony Soprano in the hospital, this moment reinforces the general axiom that HBO shows should stay away from dream sequences.